LIVERPOOL midfielder Adam Lallana hopes the club can make it back to Wembley for the FA Cup final to end a season he admits has “not gone great” for him. Lallana was one of three players Brendan Rodgers signed from Southampton in the summer for a total outlay approaching £50m and as the season draws to a close it’s fair to say that none of the trio have had the impact expected of them so far. Dejan Lovren – Liverpool’s most expensive ever defender at £20m – had a shaky start to the season and eventually found himself unable to get a place in the starting line-up even when manager Rodgers was starting with three centre-backs. Rickie Lambert, signed for just £4m, was always going to be back-up but with Daniel Sturridge missing more than half a season he would have expected more than five league starts – and more than three goals from his 30 appearances overall. Lallana is the second most expensive Reds signing ever (Andy Carroll still tops that chart) but a number of injury setbacks restricted him to 21 league appearances, 35 overall, but he still might have expected to have chipped in with more than 4 goals by now. What does he think of his first season? “It’s not gone great”, Lallana admitted. “It started off with injury and I’ve had another over the last few weeks with a few more in between. There have been times when he’s been fit and available but left out, a situation he would not have been accustomed to previously when he was both captain and a key player at Southampton. No player likes being injured, no player likes being left on the bench. “It’s been quite frustrating if I’m being honest and I haven’t been out on the pitch as much as I’d have liked,” Lallana says. He’s now hoping he can at least see the season out and end it on a high: “I want to be fully fit for the run-in,” he says. Liverpool of course have to get past Aston Villa on Sunday first, but if they do, and can then get past either Arsenal or Reading in the final, Lallana says it would mean they had hit their target for the season: “It would be really special. We said at the beginning of the season our aim was to get to the final of a competition and win some silverware. We are still in that position at the moment. Liverpool currently lie fifth in the table, four points behind a faltering fourth-placed Manchester City, and this season is a far cry from last. 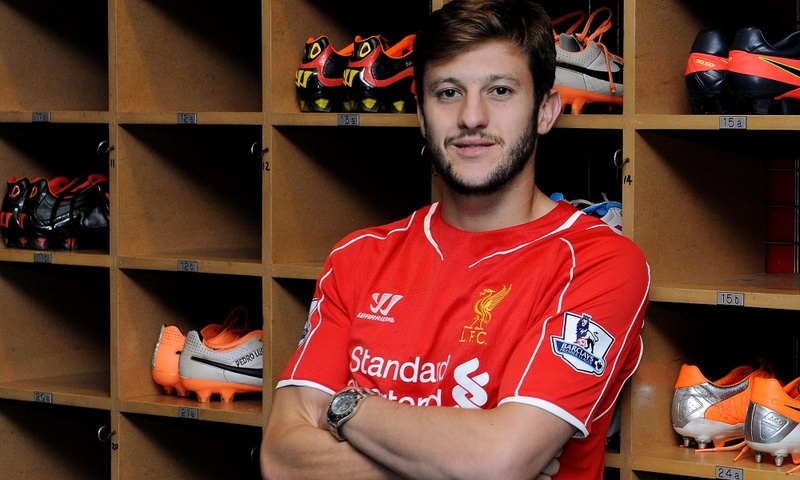 Lallana says the number of new signings the club made has played a part in a difficult season. “We’ve had some ups and downs and we knew it wasn’t going to be easy with the amount of new recruits that came in, but I think we’ve proved to everyone and ourselves that we’re a good team. Rodgers changed Liverpool’s formation to a 3-4-3 after his side had struggled for most of the first half of the season, but successive defeats to Manchester United and Arsenal saw him revert to a conventional back four for the last couple of games, including the replay against Blackburn that saw the Reds into this semi-final. We’ll have to wait until Sunday to see which system the manager chooses for Wembley’s ‘wide open spaces’ but Lallana feels the side are equipped to be flexible. “It’s been exciting playing in the new formation, but I feel we can utilise a number of different formations which is always handy to have. As for Villa, Lallana is well aware of the threat they pose since Tim Sherwood took over as manager from Paul Lambert: “They’ve picked up and had a great result at Tottenham last week – hat shows they are definitely in good form. “Benteke is finding the net again so we have to keep our eye on him, but we’ll be concentrating on ourselves and playing well.